In 1874 The Freeport Public Library began as a 250 volume collection called the Young Men’s Library Association. Miss Winifred Taylor was the inspiring teacher who led the way to this collection being started. In 1890 the Freeport Public Library was formally adopted by the City and the first library board was appointed. In 1890 the library moved to the first YMCA building in Freeport on Walnut Street. Twelve years later, in 1902, the Carnegie Library on Stephenson Street opened. 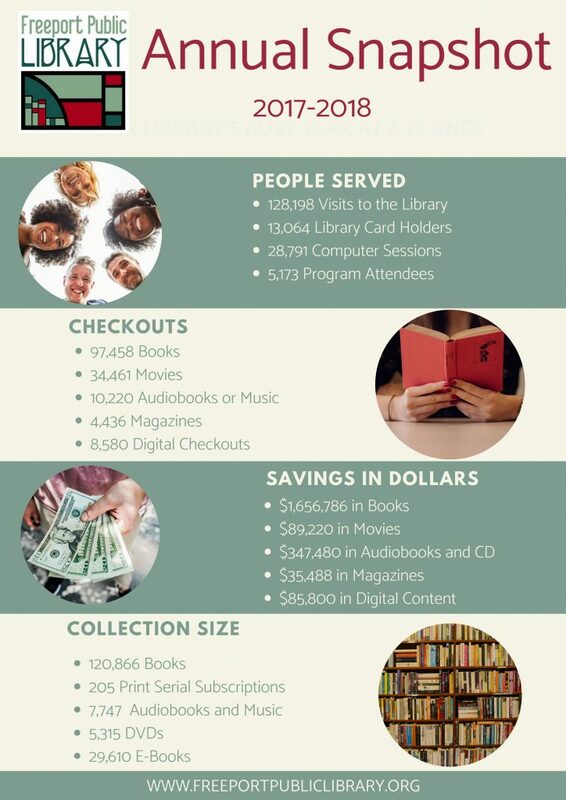 By the Library’s 50th anniversary in 1924, 1,259 residents had library cards and the library had 43,170 books that circulated 91,559 times in a year. In 1928, a branch location opened, which served around 700 borrowers in the first year. This branch remained an active location until 1971. From 1952, with the introduction of music albums and records, to today, the library expanded its resources and formats. After outgrowing the Carnegie building, planning for a 21st Century library building began in 1991. Eleven years later, in 2002, ground was broken at the current location on Douglas Street. In 2003, the doors opened on a beautiful 40,000 sq. foot building where services, programs, resources and materials continue to change and grow with our population.